Our dedicated confined space team are qualified to the highest standard and have been trained. Our specialised team is qualified to operate B. A. and gas detection equipment. This high level of training ensures efficient, professional and above all, safe workmanship. Confined space working is used in areas such as tanks, sewers, tunnels and culverts found in underground areas like power stations and hospitals. 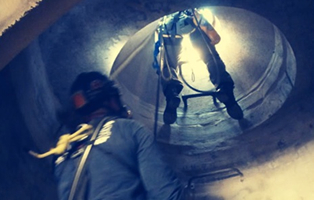 Working in confined spaces presents difficulties and dangers as well as strict health & safety regulations that govern the people who are commissioned to carry out the work. Every member of our specialist tank cleaning team is qualified to ESS Safeforce - Confined Space Entry-Escape sets, working BA & Rescue with Airline BA level. Safety is our first priority, so our teams will always arrive on site equipped with gas monitoring equipment, resuscitation and other safety equipment and carry out full risk assessments and method statements before starting work. That way, we ensure everyone’s health and safety is fully protected and you have complete peace of mind while we get on with the job in hand. 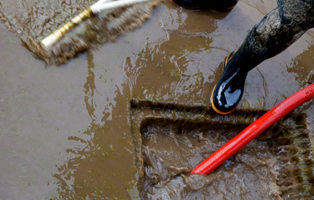 The only way to get your working environment, facilities and drainage systems really clean is to get the professionals with the specialist expertise and equipment in to do a really thorough job. 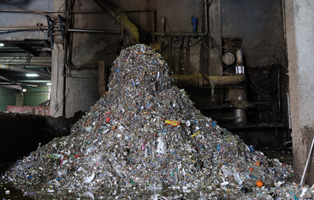 ICS Ltd is a leading force in industrial cleansing and jetting services and we’re relied upon throughout numerous Paper Mills and Heavy Industries throughout Kent to clean and maintain working environments and facilities to the highest possible standards. 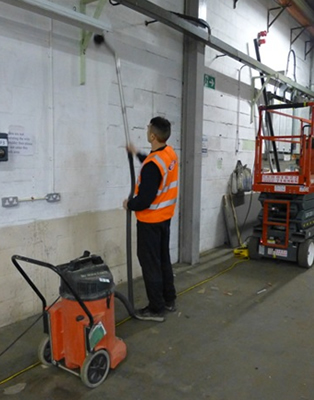 Our specialist industrial cleansing and jetting teams tackle a diverse range of cleaning activities from structural cleansing of exterior buildings and graffiti & gum removal to canopy and tank cleaning. We use the industry’s most advanced equipment to take on every job from light cleansing tasks to facilities that demand our heavy-duty cleansing and high pressure jetting services. You can rest assured that ICS has the team, the experience and the equipment to handle the job quickly and professionally. You can call on the team’s services for a one-off deep clean when you need it or as part of a cost-effective, tailored maintenance plan that’ll keep all your facilities sparkling clean all year round. This is a range of services that are designed to deal with situations ranging from regular maintenance to one off cleaning operations. We offer specialist equipment and a profession, fully trained team to visit your site. ICS operate a range of jetting equipment for a wide variety of tasks. We can supply hot and cold pressure washers, high pressure-low volume or low pressure-high volume, depending on the requirement of the job in hand. Operating pressures vary from 2,000 psi up to 15,000 psi and enables us to tailor the equipment requirements to your specific needs. We undertake a wide variety of contracts, including oil spill clean up, tank cleaning. There are numerous applications of cleaning with high pressure water, should you be unsure of whether this type of cleaning would be of use in your situation please contact us. 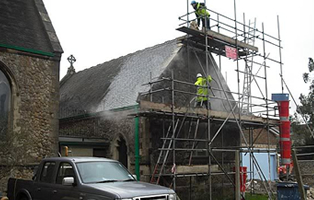 Our team of specialist industrial cleaning operatives use mobile steamers with an output of 4000 psi together with environmentally friendly chemicals to remove mortar, dirt, staining and common job construction site soiling from brickwork. ICS operate a flexible approach with the construction industry understanding that completion times can often be changeable. Algae is not only unsightly but can be a health and safety hazard when on a surface that your staff and customers walk on everyday. Using chemicals and our mobile steamers, we can remove algae, organic growth and micro-organisms from a multitude of surfaces. ICS can remove your graffiti using our mobile steamers. Once removed, a protective anti-graffiti removal coating can be applied to ensure easier subsequent removals. 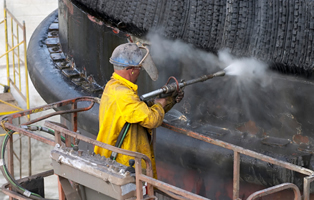 When preparing surfaces for inspection or new coatings, water jetting offers many advantages over traditional shot and grit blasting (such as no secondary damage, contamination or profiling), and is quicker, safer, cleaner and more flexible. Keeping your storage tanks clean and well maintained are just part of the responsibility that comes with ownership of these facilities. Commissioning regular cleaning will help to protect tank components, eliminate the risk of cross-contamination, help to extend the working life of your tank – and all that will save you time and money. ICS Ltd is an expert in industrial tank cleaning and we specialise in cleaning and maintaining tanks that contain anything from sewage waste to hazardous fuels and chemicals. If you want to keep your storage tank in perfect working order, we recommend you commission a regular, thorough clean by our tank specialists who have the confined space entry qualifications required to work in these extreme environments and who can provide entry permits and certification of gas-free and clean tanks where applicable. We will clean the sludge from the base and walls and then, we’ll jet the surfaces at high pressure for a really deep clean. 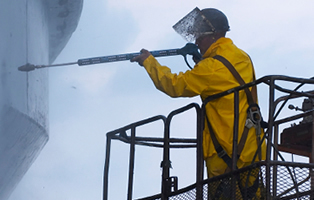 The whole process is conducted quickly and safely and powered using equipment and cleaning operatives. ICS Ltd only use the latest up to date equipment as cleanliness and reliability is a top priority. Large High Pressure Water Jetting units are used to carry out a wide variety of duties including, drain cleaning and de-scaling Foul and Surface water drainager. We have particularly high flow equipment which can not only be used for drain cleaning but also for root cutting and heavy silt removal. ICS offer a commercial cleaning service to commercial and retail businesses using high pressure water jetting cleaning technology to ensure their buildings external appearance and cleanliness are maintained to a high standard. Chewing gum, moss or general dirt can have a negative effect on the appearance of a building. This can make walkways and surfaces slippery, and a danger to your staff, visitors and customers alike. ICS can ensure your building, premises or forecourts are cleaned to the highest standard and enhance the overall appearance of your premises or business. Our commercial cleaning service is carried out by an experience team of operatives, using high pressure water jetting, which can remove all forms of dirt including chewing gum, moss etc. We can offer commercial cleaning services during normal working hours or out of normal hours, if your business requires. Approx irately 50,000 slips, trips or falls are reported each year in the UK to the Health and Safety Executive. 10,000 of which result in disabling injuries and 95% in broken bones. Uneven walking surfaces are largely to blame, with we, or non-repaired paving giving rise to a growing number of accidents. ICS provides a fast and professional high pressure cleaning service for commercial forecourts, supermarkets and large scale real estate. We pride ourselves on the high quality of work we carry out, whether the job be large or small. Chewing gum is everywhere! Look at the pavements, those black spots are chewing gum. Have you ever tried to remove them? Traditional methods of freezing, scrubbing, use of chemicals and pressure washing of pavements are slow and ineffective. Now, using the latest technology chewing gum can be removed very quickly and completely without the use of chemicals. When the combination of steam and pressure are directed at the chewing gum from the lance it simply disintegrates into microscopic particles that are not sticky. This process uses minimal water and is completely safe to use in public areas as the steam is only hot within a few centimeters of where the lance is directed. We first put down a foaming detergent to lift the oil from the surface of the driveway and repeat this process until the oil has been physical removed. We then pressure clean the entire area with a surface cleaner to remove all moss and ingrained dirt. Once dry we put down a special asphalt enhancer which will remove all traces of the stain and bring the drive back to near new. High level areas both internally and externally in industrial fabricators, food manufacturers, retail and leisure facilities are often extremely difficult to keep clean and hygienic. They often require the use of specialist equipment and chemicals to ensure that essential high level cleaning is carried out in a safe and controlled manner. There are many types of organisations that use us for high-level work, including warehouses, offices, schools, and sports halls. Each site we clean is different and is assessed carefully before being tackled. Business downtime is of critical importance to you, and we do everything in our power to minimise disruption.